Unsurprisingly, the World Cup 2018 in Russia has shaken up the gambling industry, causing a surge in online and land-based wagers during each leg of the competition. But while seeing an increase in wagers at traditional bookmakers during the cup isn’t anything new, it’s surprising to see a big increase in Bitcoin wagers, which is exactly what happened at Cloudbet Casino and Sportsbook. Namely, the Bitcoin betting platform saw a six-fold increase in online wagers, thanks to a few special promotions designed to draw Bitcoin punters to its site. A few weeks back, the promotions team at Cloudbet released a new set of promotions for the World Cup 2018. For starters, the site pumped up its betting limits to 20 Bitcoins per bet for the knockout stages of the tournament. Next, it opened up the betting limits to a staggering 100 Bitcoins per bet for the July 15th finals. And lastly, it also gave new customers a chance to take a risk-free bet on any match in the competition. And now, it seems that those promotions are really paying off as the site is witnessing a huge increase in wagers placed in Bitcoin and Bitcoin Cash. 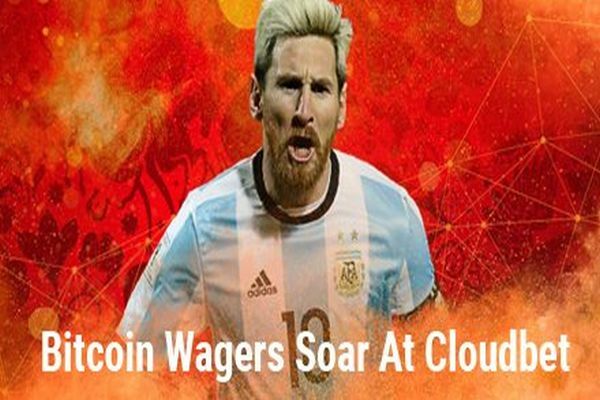 According to an official update, over the first 10 days of the World Cup, Cloudbet saw an increase of 600% in wagers made with Bitcoin and its offshoot cryptocurrency from the same period before the competition began. And reportedly, the wagers are coming from punters in over 100 different locations from across the globe. According to the head of acquisition at Cloudbet, Mirio Mella, the reason for such an increase in Bitcoin bets is that the Cup provides an opportunity to punters to enjoy great excitement during the matches that’s paired with a chance to grow their investments. The number of bets is also indicative of Bitcoin’s acceptance on a global scale as a practical and convenient payment option for bettors, Mella adds. Apart from the sports promotions that were recently launched by Cloudbet, another thing that might be driving more punters to the platform is the site’s low betting margin of 2.5% when compared to other Bitcoin sites. Moreover, Cloudbet isn’t only an online sportsbook for cryptocurrency users but also a diverse Bitcoin online casino. Cloudbet’s casino platform is powered by more than a few big software providers, including online casino pioneers Microgaming as well as other respected studios like Play N’ Go and NextGen. There are over 600 different games to be found on the site, the majority of which are modern slot machines. But if you prefer playing table games, you can also find a small selection of virtual tables as well as live dealer games from Evolution Gaming at the casino. If you’re new to the site, not only will you be able to get some risk-free bets on the World Cup, but Cloudbet will also offer you a chance to grab a 100% casino match bonus of up to 5 Bitcoin! For more information on any offers at the site, you can pay a visit to Cloudbet and check out the platform.